The artist is not trying to explain this world; he is merely trying to reveal it in its diversity. 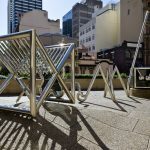 On the secluded North Terrace of Sydney’s Town Hall stands this unique sculpture – a monument to Australia’s close association during the 1930s with pioneering inventor and electrical engineer Guglielmo Marconi. 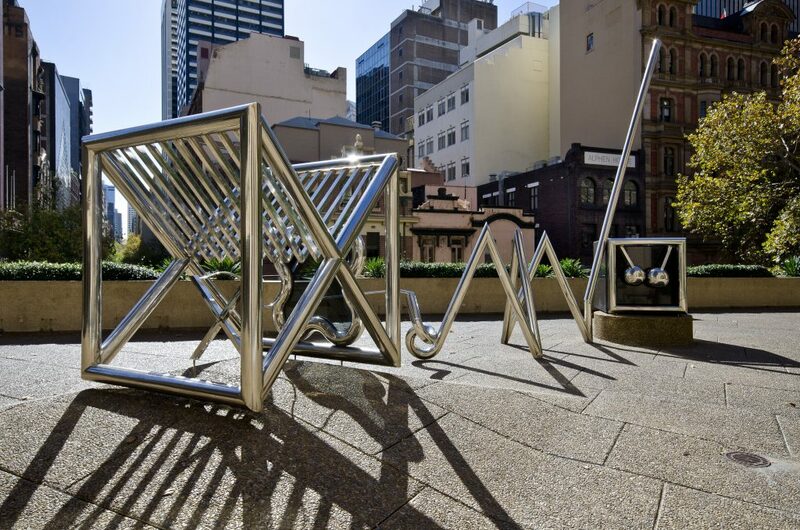 The artwork, by sculptor Michael Kitching, was a gift to the people of Sydney from the Italian community. It commemorates the centenary of Marconi’s birth, and his outstanding contribution to the development of Australia’s international communications network. 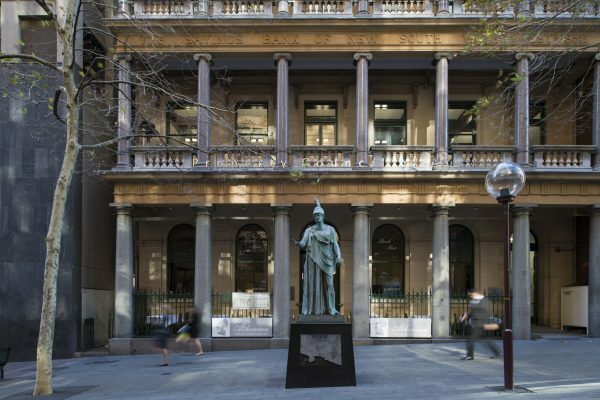 The sculpture was inspired by the events of the night of 3 March 1930, when Marconi made wireless history by lighting up Sydney’s town hall from his yacht in Genoa – more than 16,000 km away. Never before had a radio signal been transmitted so far, and it was the first time that enough power had been transmitted to remotely operate a switch. To the delight and amazement of a spellbound audience, the Town Hall’s lights blazed to life just one seventh of a second after Marconi sent the signal. Kitching’s artwork in granite and stainless steel represents the Morse code transmitter and receiver used in those historic events, connected by a radio mast and the jagged line of Marconi’s radio wave – echoed in twisting shadows on the sculpture’s stone base when the sun blazes down on the steel. British-born Michael Kitching arrived in Australia in 1952. He began his career as a teacher, but quickly resigned to pursue his art. Kitching worked with a wide range of textures and materials, including aluminium, perspex and mirrors, and won an array of awards and prizes for his painting and sculpture. 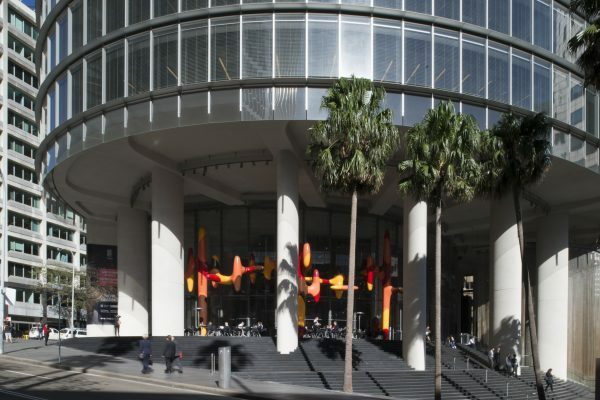 His work is displayed in galleries throughout Australia, including the Australian National Gallery. 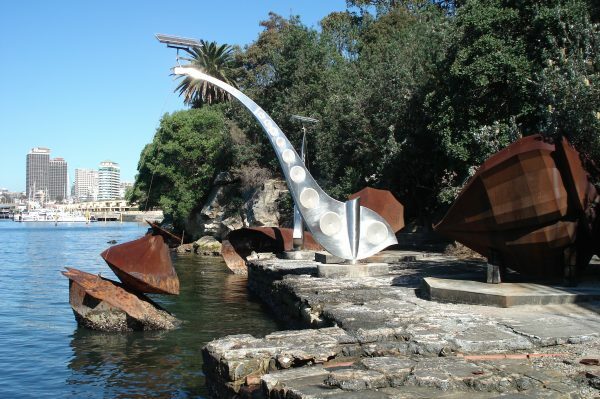 He was commissioned to create a number of large sculptures, including this memorial in honour of Guglielmo Marconi.